In food processor, chop garlic and nuts until finely minced. Add remaining ingredients and process until pastelike. Use as a dressing for salads or as a topping on baked potatoes. Susan, it’s a wonderful recipe for Pesto, and all the better for being without olive oil. In fact, I made it without the nuts yesterday, used a tad less water and it was delicious! It was more liquidy than “normal” pesto, but that was perfect because I used it as a salad dressing. I used organic white miso instead of tofu. THis recipe was awesome!! I was so impressed. Served it with whole grain rotini and vegetables. Big hit. I always use ground natural almonds (aka almond flour) in my pesto’s to save a bit of cash as other nuts are pretty costly where I live. It always turns out great this recipe included! Thank you for this wonderful recipe. 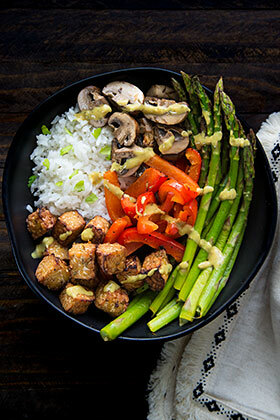 Is it possible to make it truly fat free, i.e., replace the nuts and tofu with something? That’s exactly right. There’s no fat added to make tofu–it’s just soybeans and a curdling agent. All the fat comes from the soybeans themselves, which are higher in fat than most beans. Can someone enlighten me about the fat content in tofu? I thought it came from the soybeans themselves and was not added during the process of making the tofu. 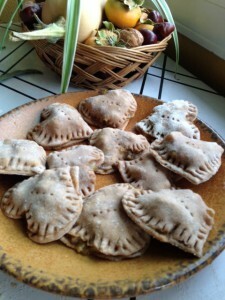 I’m enjoying this fat free vegan recipe site. I’m going to try this recipe when I get home this evening, but instead of tofu, I plan to use an “Oil-less Oil” recipe I learned from the Benton Sisters that’s basically a heated mixture of filtered water, cornstarch, salt and a dried basil (although I guess you could use any dried herb you want). I’m really excited to give it a try, and I’ll post the results to let the interested know how it turned out. And Ms. A. Fisher: if you still haven’t found Nutritional Yeast, try your local natural food grocer. They’re sure to have it. I made this pesto last night and used it on whole wheat vegan pizza crust as the sauce. It was really good with assorted roasted vegetables. I will definitely make it again, it was delicious! I’ve never seen a pesto with no olive oil. Hmm. I’ll try it. I made a bunch of this stuff and have been eating it for the past couple days, with some whole wheat pasta and zucchini pasta. It was great! I forgot to add the nutritional yeast but it was still really good. Yeah, it’s not fat free but at least with the tofu you get protein, calcium, etc. Also the nuts make it a bit fatty but I think eating nuts in moderation is really good for you. LOVE this pesto! I don’t think most non-vegans would even notice that it’s not the “real” thing! I am using it in a panini recipe I will be submitting soon! Tried this recipe this evening. Love it. 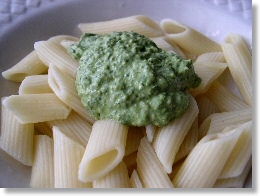 Of course, since silken tofu is not fatfree, this pesto is not fat free, but it’s lower fat than using olive oil. I found nutritional yeast in bulk at a local Sunflower Farmer’s Market store in AZ. where do you get “nutritional yeast”? I am having a hard time finding it. This looks great! Any info on how long it will keep in the fridge? You can definitely use spinach and other herbs instead of the basil. Nutritional yeast is a little harder to replace, but you could try using a little miso or vegetarian bouillon. I’m allergic to basil. Can this be made with 1 part spinach and 2 parts parsley or cilantro?